Silver rings are often linked to low quality low priced jewels and this is quite sad. Interestingly, silver along with gold are the two precious metals that have adorned millions of jewels since ancient times. Jewelry lovers have in recent years started, appreciating silver for it's sheer beauty and timeless look. We have therefore noticed a surge in demand for quality 925 silver rings, quality conscious buyers are not always after low prices - they are willing to pay for quality. 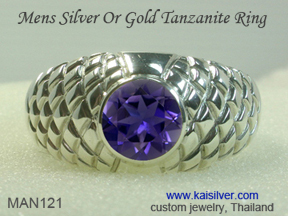 Kaisilver crafts both gold and 925 silver rings with the same level of quality and passion, this has been our policy ever since we entered the industry around 2 years ago. We can craft custom 925 silver rings based on design concept provided by you or, you could pick a jewel from our website and request for it to be custom made in silver. Since all our rings and other jewelry can be ordered in gold or 925 silver with gemstones of your choice, we do not have a specific 'silver ring' category. If you plan to get a silver gemstone ring, you will get the benefit of our unmatched expertise in gem procurement and cutting. With direct access to over 200 million carats of cut and polished stones and direct links, to almost every gem mining center in the world - we do not restrict your gem choice to what is shown on our website. Since we custom cut all gems, the shape, size and dimensions of the stone can be decided by you. Before you decide to plate or not plate your custom 925 silver rings, here is a clear explanation related to both options. Silver by its very nature will tarnish, this is an unavoidable fact but, can you prevent a sterling silver ring from tarnishing. Jewelers offer a few types of anti-tarnish plating on silver for example, rhodium, yellow gold, white gold, rose gold or even platinum. Besides preventing the silver below from getting oxidized (source of tarnish), the plating also adds an extravagant look to the jewel. Everything sounds great until this stage but, the important fact is that the plating on your silver ring will never last forever. The plating will not wear off uniformly all over the ring, it can happen in patches or streaks. The exposed portions under the plating will gradually discolor due to tarnish, cleaning the jewel from that point onwards can be tough. 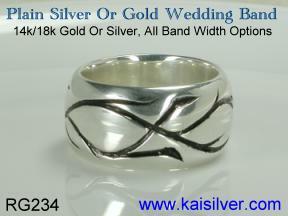 Let's look at the other option, of not plating your custom 925 silver ring. The ring will obviously tarnish but, the cleaning process will be much easier as long as, you do not allow the tarnish to settle for long and become stubborn. Kaisilver can custom make your silver ring according to your instructions for plating, so make sure that you fully understand the plating issue. Designs can be yours or ours - no limitation on design. Fine craftsmanship and handpicked gems for all silver and gold rings. Plating done on your request but, please read above report before making a decision. All gemstone options, selection need not be limited to what is on our website. The same quality standards applied to gold and silver jewelry. Custom silver rings are available in all ring sizes. Jewelry with that classic antique style and look are best rendered in sterling silver. 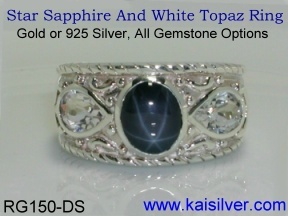 This star sapphire and white topaz ring, can be crafted in gold or sterling silver ... more. A handsome men's silver tanzanite ring, also available in 14k or 18k gold. 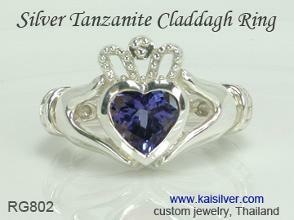 Tanzanite a gemstone that is rarer than diamonds, is suitable for both men and ladies ... more. Celebrating the timeless appeal of 925 sterling silver and the stunning beauty of a gem that is rarer than a diamond, tanzanite. The gem has been a recent find ... more. 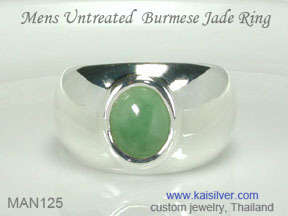 Natural untreated Burmese jade for this sterling silver men's jade gemstone ring. Affordable price and custom made in all ring sizes, your design or ours ... more. A silver band ring, also available in gold. An ivy creeper is etched all around the band of this silver ring. The ring can be customized with your preferences ... more. 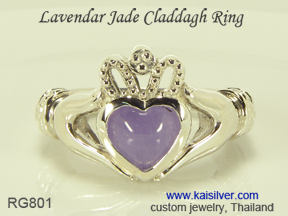 Kaisilver provides the same quality of gems and craftsmanship for gold and silver claddagh rings, our rings retain the full meaning of the 4 century old jewel ... more. 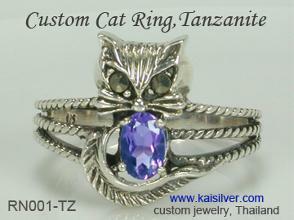 A hint of tarnish on the silver cat ring, helps highlight the intricate design of this cute gem stone cat ring. Available in gold or 925 silver with your choice of gemstone ... more.